We investigated the associations of reproductive factors related to childbearing with percent breast density, absolute dense and nondense areas, by menopausal status. This study included 4110 cancer-free women within the Nurses’ Health Study and Nurses’ Health Study II cohorts. Percent breast density, absolute dense and nondense areas were measured from digitized mammography film images with computerized techniques. All density measures were square root-transformed in all the analyses to improve normality. The data on reproductive variables and other breast cancer risk factors were obtained from biennial questionnaires, at the time of the mammogram date. As compared to nulliparous women, parous postmenopausal women had lower percent density (β = −0.60, 95 % CI −0.84; −0.37), smaller absolute dense area (β = −0.66, 95 % CI −1.03; −0.29), and greater nondense area (β = 0.72, 95 % CI 0.27; 1.16). Among parous women, number of children was inversely associated with percent density in pre- (β per one child = −0.12, 95 % CI −0.20; −0.05) and postmenopausal women (β per one child = −0.07, 95 % CI −0.12; −0.02). 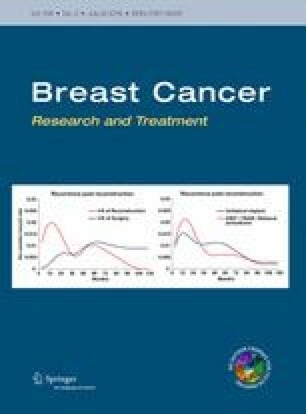 The positive associations of breastfeeding with absolute dense and nondense areas were limited to premenopausal women, while the positive association of the age at first child’s birth with percent density and the inverse association with nondense area were limited to postmenopausal women. Women with greater number of children and younger age at first child’s birth have more favorable breast density patterns that could explain subsequent breast cancer risk reduction. This study was supported by the National Institutes of Health (Grant number CA131332 to R.M.T., CA175080 to R.M.T., CA087969 to R.M.T., UM1 CA186107 to M.S., UM1 CA176726 to W.W.); Department of Health and Human Services; Avon Foundation for Women; Susan G. Komen for the Cure®; and Breast Cancer Research Foundation. Dr. Colditz was supported in part by an American Cancer Society Cissy Hornung Clinical Research Professorship. Dr. Bertrand was supported in part by the Simeon J. Fortin Charitable Foundation, Bank of America, N.A., Co-Trustee. This study was approved by the Institutional Review Board at the Brigham and Women’s Hospital. Informed consent was obtained or implied by return of questionnaires.